The building sewer (sometimes called the service pipe) is the pipe that extends from your building through your yard and connects into a sewer “lateral” near the curb line or edge of an easement. The owner of the property is responsible for maintaining and cleaning the building sewer within the building as well as the line in the property up to the connection point to the lateral. A cleanout is typically installed near the connection point and is considered part of the building sewer. A sewer main is a larger pipeline, usually in the street or through an easement, that transports the sewage from many homes and buildings to the wastewater treatment plant. A sewer lateral is the short pipe line that extends from the sewer main to the curb line or property line, or where the building sewer connects. The Authority is responsible for maintenance of the sewer lateral and sewer main only. The property owner can do many things to prevent the sewers from backing up. If everyone would be careful about how they dispose of certain products, our systems would be a great deal more efficient, experience far fewer backups, cost us all less money, and prevent a lot of misery. More often than not, the cause of a backup in the lateral or building sewer is from items that the line is not meant to handle, such as kid’s toys, underwear, candles, towels, diapers, paper products (other than toilet paper), keys, and even false teeth. To avoid flushing these items, remember to close the toilet lid. What you flush down the toilet may not only affect you, but it might also cause problems for your neighbors! Another possible cause of problems could be roots in your building sewer. It’s best not plant trees or bushes above your building sewer. 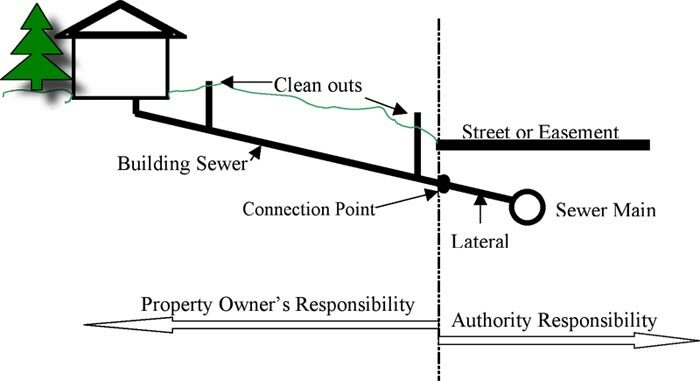 The building sewer is the responsibility of the owner of the property from the house to the connection point of the lateral. You will need to call a plumber or sewer/drain cleaning service. It may be in your best interest to obtain several estimates. The Sewer Authority cannot make a recommendation. Grease: Cooking oil should be poured into a heat-resistant container and disposed of, after it cools off, in the garbage, not the drain. Some people assume that washing grease down the drain with hot water is satisfactory. This grease goes down the drain, cools off, and solidifies either in the drain, the property owners’ line, or in the main sewer. When this happens, the line constricts, and eventually clogs. Paper Products: Paper towels, disposable and cloth diapers and feminine products cause a great deal of problems in the property owner’s lateral as well as in the sewer main. These products do not deteriorate quickly. They become lodged in portions of the lateral/main, causing a sewer backup. These products should also be disposed of in the garbage. Roots: Shrubs and trees, seeking moisture, will make their way into small cracks in a sewer pipe. These roots can cause extensive damage. As the tree or shrub continues to grow, so does the root, and in time will create a blockage in the pipe. Old clay or iron pipe may be more susceptible to root penetration but it could happen to new plastic pipe. Avoid planting trees near your building sewer. If you have continuing problems with tree roots in your building sewer, you may have to have them cut or treated periodically. If you have a plumber cut out roots in your building sewer, please call us, so that we can also inspect the sewer main. Sewer Odors: Another concern that property owners have is that they smell sewer odors inside their home or building. These odors may be coming from little-used or unused drains in your building. Under each drain in your plumbing system, there is a “P-trap”. If there is water in this fitting, odor or gases from the sewer cannot enter through the drain from either the property owner’s lateral or the sewer main. Without regular use, the water in the trap will evaporate. Periodically flush some water down unused drains, sinks, etc in order to keep the P-trap full. Another way to prevent sewer odor is to ensure that the vents, which are located on your roof, are free from bird nests, leaves, etc. Proper venting is necessary for your system to drain properly. Illegal Plumbing Connections: DO NOT connect French drains, sump pumps, rain gutters, and other rainwater control systems to your sanitary sewer. It is illegal, and debris and silt will clog your line. That extra storm water in a sewer pipe could cause the pipe to overfill and back up. Consult a plumber to correct any illegal connections. Needles: Unfortunately, some people dispose of hypodermic needles in the sewer system. The presence of these needles in the wastewater collection system presents special and possible deadly problems for wastewater collection and wastewater treatment employees. PLEASE DO NOT FLUSH NEEDLES. The proper method of disposal is to re-cap the needle and put it into a “sharps container”. (This could be any rigid plastic container such as a bleach bottle…no milk bottles please.) When it is full, tape the container securely, and call your local pharmacy for advice on proper disposal methods. PLEASE DO NOT FLUSH THEM OR THROW THEM INTO THE GARBAGE! A sewer backup in your home can create a stressful and emotional situation for the homeowner or tenant. In some cases, it may cause health and safety concerns as well as significant property loss. A proper response to a sewer backup can greatly minimize property damage and diminish the threat of illness. If you are experiencing a sewer backup, please call the Sewer Authority immediately. If it is after office hours, call the office number, and you will be directed to the emergency voice mailbox. Leave a detailed voice message, and someone will respond as soon as possible. Authority personnel will determine the nature and location of the problem. You may also call your own plumber if necessary. Backed up sewer lines, line breaks, sewage odors and overflowing manholes are considered an emergency. Call us first before calling a plumber if you think you may have a problem. We will check the sewer main and lateral and then inform you of our findings. If the problem is not in the main line sewer or lateral, you will be advised to contact a plumber or sewer/drain cleaning service. There is no cost to you for the Authority to check. Calling during normal work hours is preferred to save all of us the expense of overtime. The Sewer Authority makes every effort to be responsive to residents’ needs and concerns when a sewer backup occurs. The Authority has a crew whose main duty is to inspect, clean and maintain sewers. Unfortunately, backups in the sewer system may still occur. Backups may occur any where in the system, in your building sewer, or in the sewer main, and can be the result of a variety of causes- including clogs from debris, roots and grease, or the system being overwhelmed by excessive ground water from heavy rain. While The Sewer Authority has adopted rules prohibiting the discharge of any substance likely to cause a sewer obstruction, and we try to educate the public about the problems they cause, there is really no way we can absolutely prevent this from happening. Many factors can cause backups and they are beyond the scope of normal maintenance. Many homeowners’ insurance policies exclude damage resulting from sewer backups. However, some insurance companies do provide sewer backup coverage. If you are concerned about the possibility of a sewer backup and want to assure that you are covered, we urge you to check with your home insurer regarding the availability of sewer backup insurance, and include cleanup costs as well as repairs and replacement. Courts have determined that local government entities are liable only if there is negligent operation of a system. A local government cannot guarantee that a public system will not backup. If you experience a sewer problem, please call the Sewer Authority office at 215-345-1225 during normal working hours (Mon-Fri, 8-4). After office hours, call the office number 215-345-1225 and you will be directed to the emergency voice mailbox. Leave a detailed voice message, and someone will respond as soon as possible. You may also call 911 and state that you are reporting a sewer emergency.